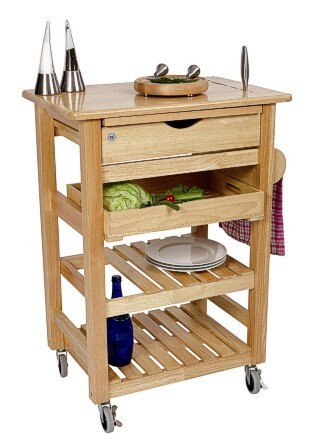 A superb kitchen trolley with a large varnished hevea worktop, extra pullout board, pull-out drawer and removable tray. It also has a hand rail/towel rail and a fully enclosed knife block for a selection of cook’s knives. A built-in slatted combined storage shelf provide the capacity to stand bottles and it stands on four wheels, two of which are lockable. Its size is 67 x 45 x 92 1/2 cm high (26 1/4 by 17 3/4 by 36 1/2 inches approx) and it is made from eco-friendly hevea hardwood. This trolley is delivered to your door flat packed and is easily assembled.